Middle School Math Moments (and more! ): Spooktacular Giveaway! 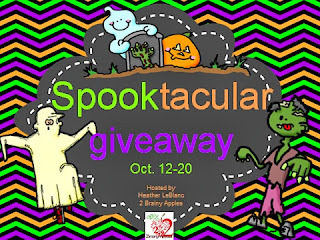 I'm so happy to help promote the fantastic Spooktacular Giveaway being offered by Heather at 2 Brainy Apples! There are 4 bundles of products to win, ranging from grades K-8. You can earn several entries a day, so be sure to stop by every day for multiple chances to win! You can enter until Sunday, Oct. 20, at midnight EST, and a winner will be chosen the following Monday. Click below to head on over to enter! Good luck!